Hello everyone!!! Hope your week is going well. I have another valentine to share. 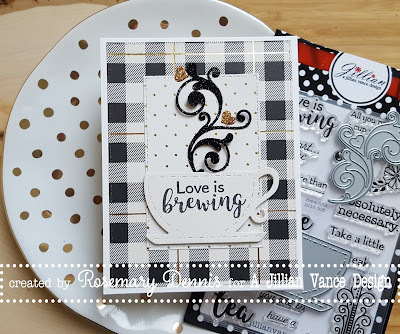 This one uses the newly released BREWtiful stamp set and the Coffee, Tea & Me dies. I told you last week how much fun I had creating the glittery heart on the card I shared and mentioned I would be using that technique again...just didn't think I would be using it on my very next card! But when I decided to make a card using the BREWtiful stamp set and the Coffee, Tea & Me dies I just had to glitter up the swirly "steam" die. 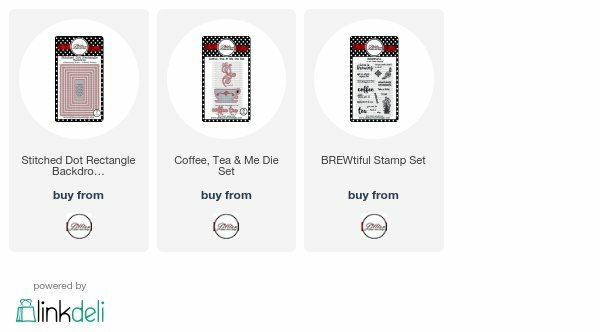 The Coffee, Tea & Me dies are stand alone dies, but they coordinate perfectly with the BREWtiful stamp set. I pulled out the My Mind's Eye Yes, Please 6x6 pad and pulled out some papers to use for my card. I die cut both layering papers using the Stitch Dot Rectangle dies and adhered them to my card base. The cup was die cut from paper from the pad and then stamped the sentiment within the cup. I adhered the double sided adhesive to black cardstock, die cut the swirl and removed the remaining backing. Then I poured on the black glitter and burnished it into the adhesive. The little hearts are separate from the swirl and so I covered those with a beautiful gold glitter that has little flecks of red in it and then burnished the glitter in. The glitter I have been using is Art Glitter Ultrafine. I adhered the cup with foam dimensionals and then used Multi Medium matte in two spots to adhere the swirl. The hearts were also adhered with the Multi Medium. I used the color scheme and love theme from the current Time Out challenge so I will be adding my card to their line up. Going to add this to the Simon Says Stamp Wednesday challenge, too. Ohhh, that plaid and the magnificent flourish of steam are fabulous!! What a PRETTY card Rosemary!! Oh wow--I want that plaid paper! 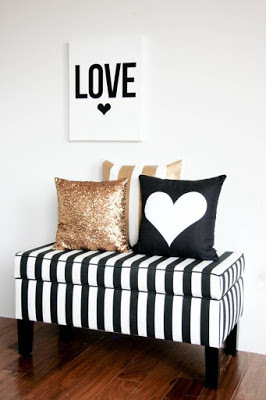 This is so modern & fun--love everything you did for this fabulous Valentine, Rosemary! Cool steam coming out of the cup - love all the glitter & the yummy plaid!! That plaid background looks so good! Funny tiny hearts! Thank you for joining us at TIME OUT! Oh my, Rosemary! That is one gorgeous cup of coffee! I love that black glittery steam!! What a fun card. Love that swirly die with the gold hearts you used as your coffee steam. Thanks so much for playing along at Time Out. Beautiful ! the gold heart is just perfect and that swirl is amazing. Congrats on the HM at Time Out!